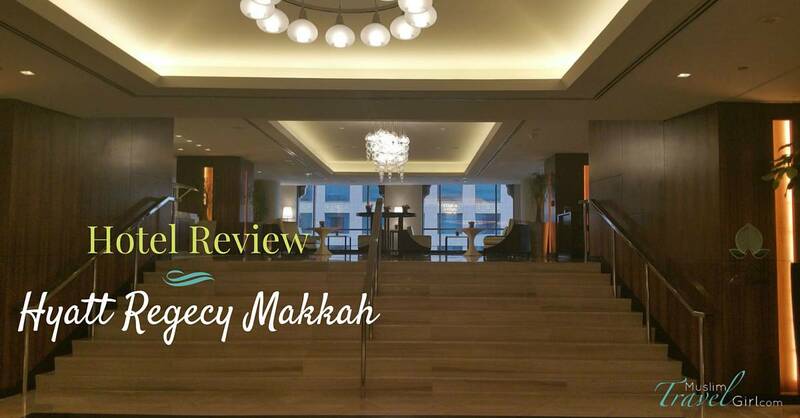 In the history of travel reports I am skipping and going to the Hyatt Regency Makkah review. I received requests for the hotel review since the property is new and people are wanting to know what to expect. Before I start I have to say this is the longest hotel stay we ever had; a total of 8 nights (9 days). As I said before we were not planning on going for Umrah in Ramadan (read here), however I was keeping an eye on the Hyatt Regency Makkah because I really wanted to check out the property. I recently wrote a comprehensive info guide with all the new hotels coming soon and this one just opened. The tentative date was the 15th of July which seemed a little odd since it was the end of Ramadan. However they changed their opening to the first of Ramadan with only one tower and 11 floors open to the public. I think the total open capacity was around 270 rooms. I couldn’t even believe they had availability on points and cash since a single night in the hotel cost 4200SAR (£570). Needless to say a happy dance was in place. We arrived at the property around noon and with no luggage thanks to Gulf Air. 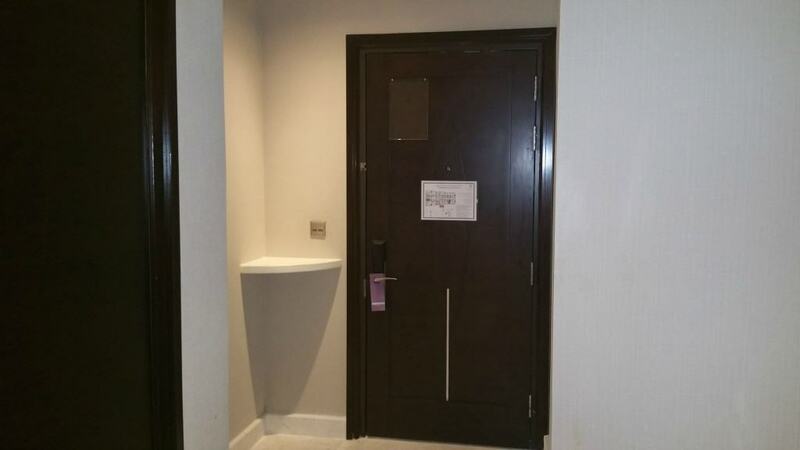 The property is in the new Jabal Omar development and currently you have to pay close attention to the turn for the hotel’s entrance. We missed the sign and ended up in front of the Intercontinental, which was not an issue really since it was easy to find. I already knew where the property exit for the mosque was. The hotel had an entry/exit into the mall so you can get through there to the reception. This is not their grand entrance but rather the exit into the Al Haram mosque. An easy find for us. However if you do have luggage you will need to drive around and enter at the proper entrance which can be a pain especially if it is Friday prayer and extremely busy. Once the whole development is completed it will be much easier to find and drive to and from all the Jabal Omar development. 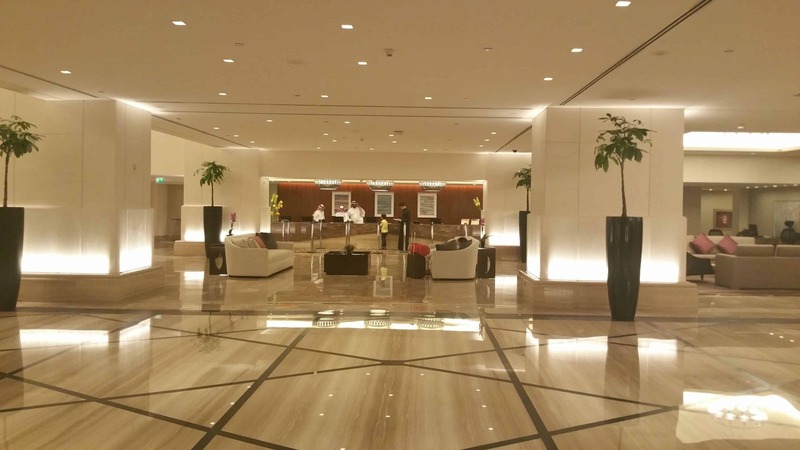 The lobby is impressive and you can see that the property is finished to a high standard. There are plenty of places where you can sit and relax and I love that even though it is an open space it is quite nicely separated. There is a nice cafe which was not open during Ramadan but the view of the new Haram extension is awesome. I did a short Periscope from the cafe which you can watch here. Check in was very easy and the staff are lovely. As I said we stayed 8 days in this property which makes this the longest stay we ever had in a hotel. Usually we stay a maximum of five days. By the end of the trip we felt part of the family and we made friends with a lot of the staff. I will try hard to not be biased with regards to this property. As a new property there were of course some issues and I will sum them up at the end. The Hyatt Regency is within the Jabal Omar development, which once completed will be an awesome place. I did post a video previously of it and you can watch it here. 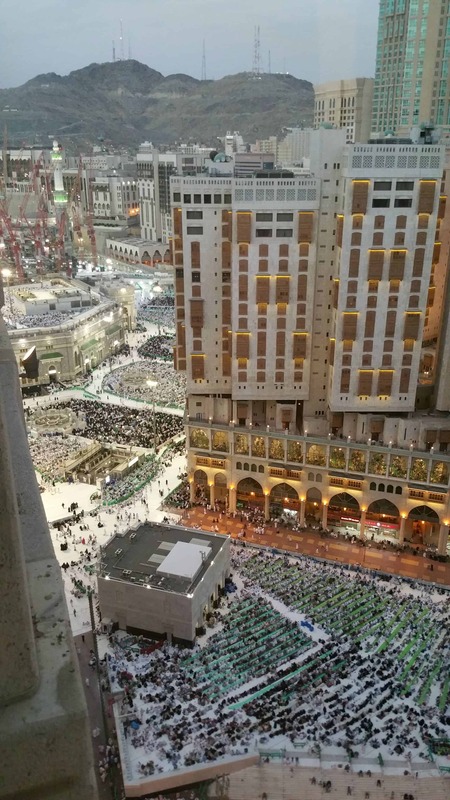 The project will transform the Haram area in years to come and it will have direct access to the Haram courtyard. The hotel is located next to the Hilton Suites which is in the same development and hopefully in September there should be a Conrad as well. You have access to the Haram on the street and mall level. You exit into the Mall and then onto the street next to the Haram and just opposite the Intercontinental. Apparently in few years the Intercontinental will be demolished so Hyatt will have unrestricted view. Woohoo! There is a BinDawood store, which is basically a supermarket with no structure or organisation, especially when it comes to tills. But it is easy to pop down and buy supplies if you need to bring them into your room. There are also shops and a food court on the top floor which also has Al-Baik, the most famous and apparently delicious chicken ever. I didn’t try it because the queues were horrendous even in the women’s section. It is approximately 2-3 minutes walk to the King Fahad Gate and into the haram, but you could also use some of the other entrances for quicker access. The room were very nice and spacious. 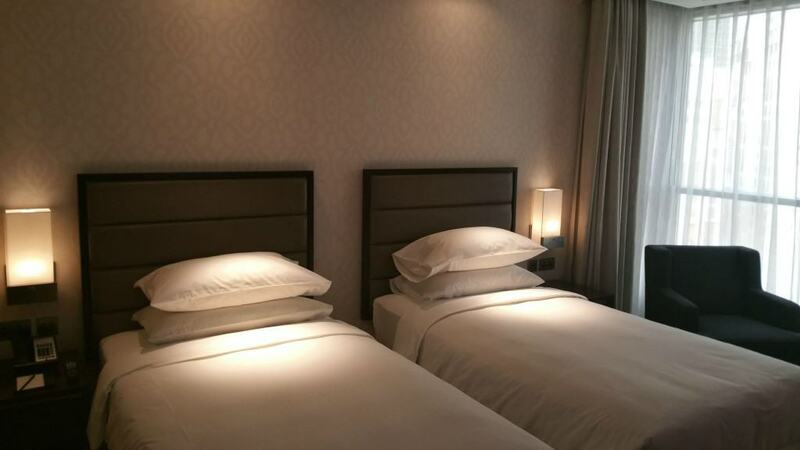 As it is brand new hotel you could still smell the freshness and paint around. 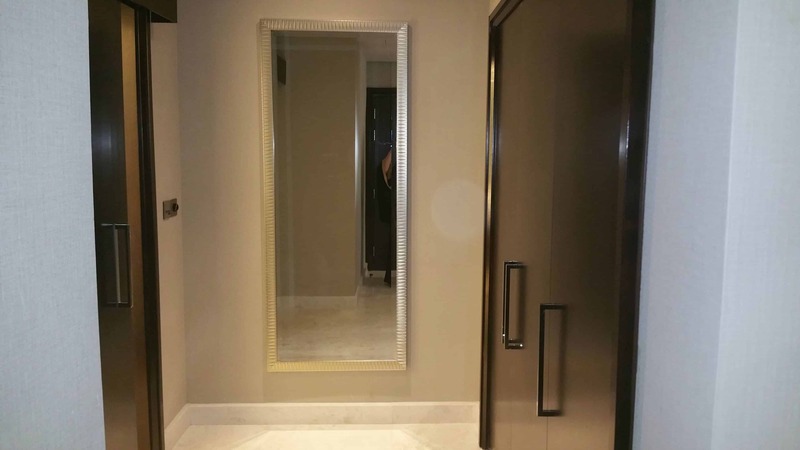 Upon entering the room you see a big mirror, which is awesome. There is also a big wardrobe. 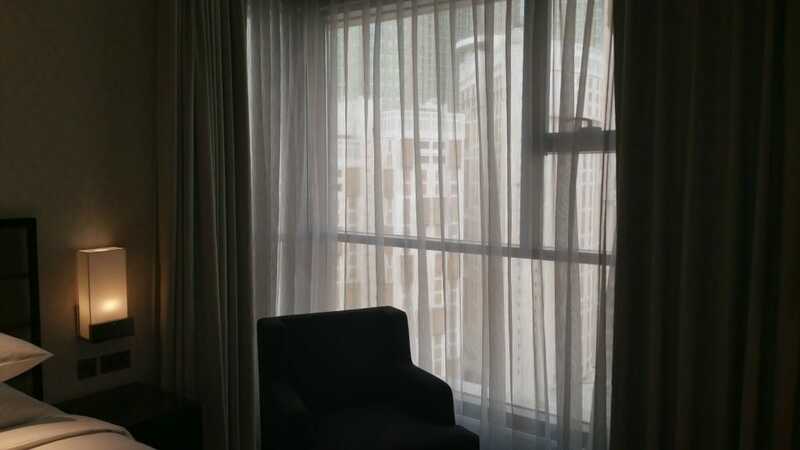 I love big wardrobes and it was one of my complaints with the Hilton Makkah. Many families when they come for Umrah they have a lot of luggage, or even if they are in groups with 2-3 people in the room you need to store your possessions. Plus pilgrims usually stay for week or more so it is essential to have some space and not walk around your suitcases. 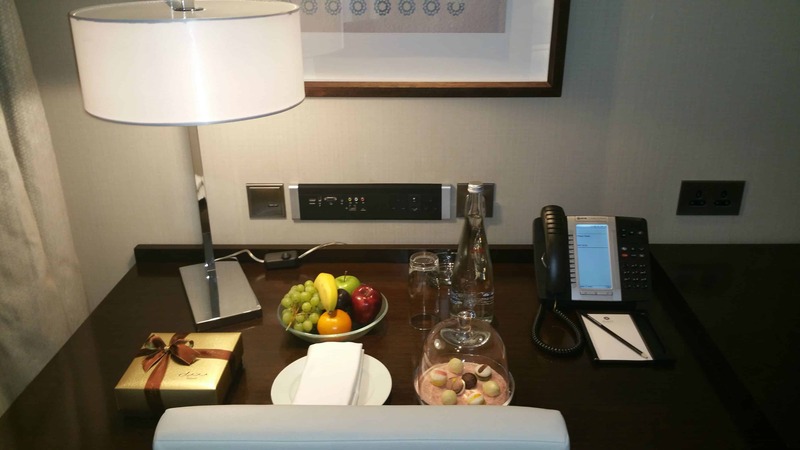 I had a very nice amenity kit waiting for me in the room, with some sweets and also Bateel dates, which became my favourite. Another good thing about our room is that there was a fridge which was empty so you could put your own drinks and snacks. I think this is brilliant and I hope they leave it as it is for families. Many hotels have their minibar there and sometimes there is no space for your drinks. Also I loved the chest of drawers which was empty, so there is plenty of storage for people. Our bathroom was certainly spacious, I think it was the case because we had a corner room, but I definitely can’t complain. 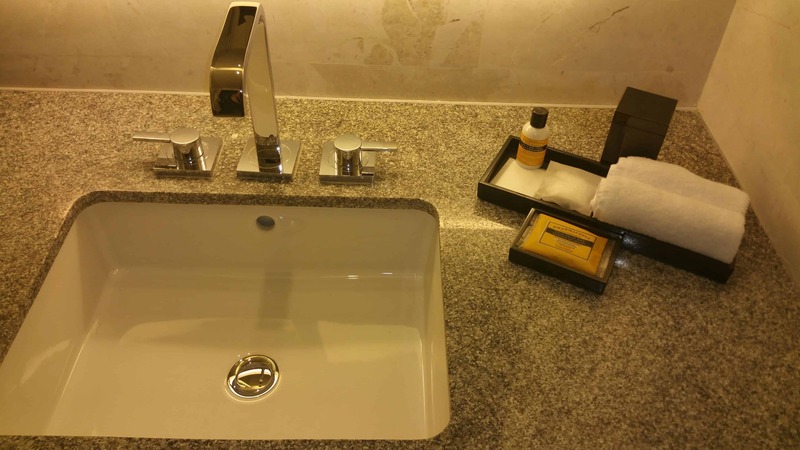 Amenities are the standard Hyatt Regency amenities. The shower had some great space and the water pressure was good as well. 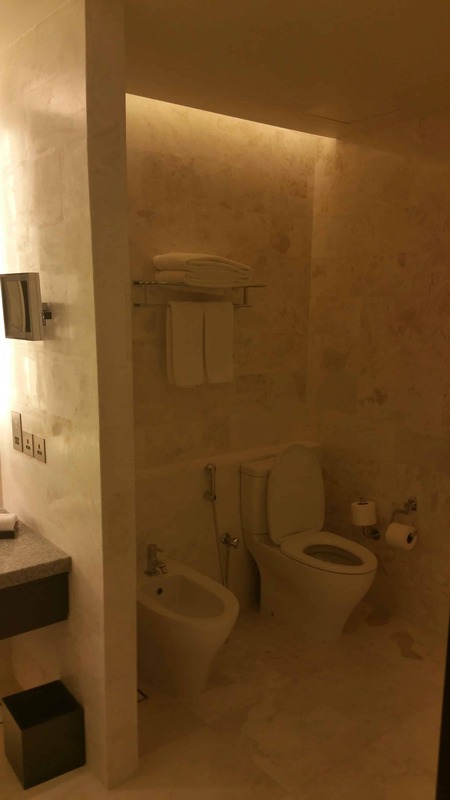 We did notice a smell in the bathroom and I was trying to figure out what it was but I just think it was the pipes. We did ask for them to come and fix it and that did reduce the smell. Considering that the hotel is new I’m sure it is something they will be addressing. There are 2 restaurants in the hotel, however only one was open during our stay. Understandably since the hotel is a work in progress. 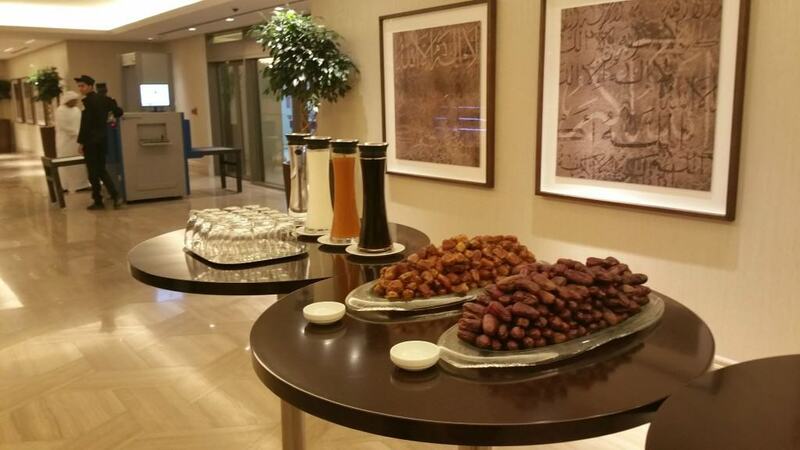 The buffet during Ramadan was extensive and very good. Blame it to 10 hours of fasting. My favourite must have been the dessert section of course. The chef must be one of the nicest chefs ever and has such great energy and passion for his role. He would go around and talk with the customers, make them really feel welcome, which I think was a great touch to make them care. During Iftar (after dawn) dinner was very good and had plenty of variety of food for those like us who were there for long time. I know that the restaurant offer three meals a day, breakfast, lunch and dinner. We tried the breakfast after Ramadan which was good. It had a good selection of food, though mainly Arabic not many Western options. I think it is probably because majority of guests are Arabs. I was told that the breakfast will be a la carte which I kind of prefer due to the fact that I can order anything I want. 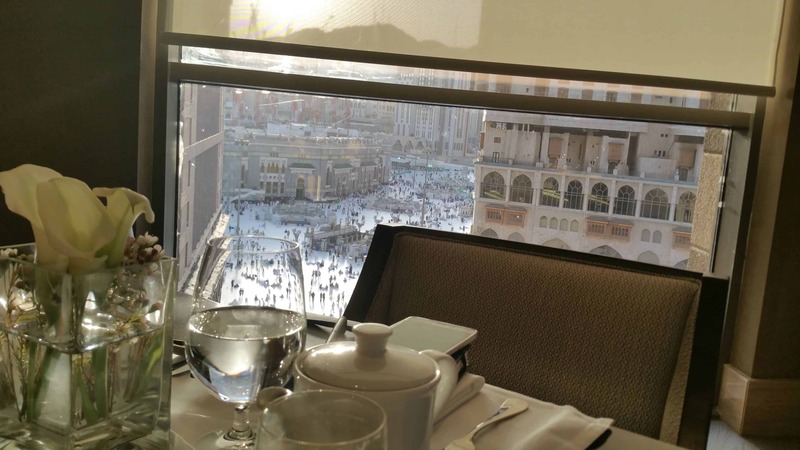 The view from the restaurant is great, you can see the Haram and the sun shining and we spent hours there talking and making friendships. The staff were always polite and at hand when needed. It is a new property so they are still learning and sometimes they did forget small things or orders but there is also the language barrier. I did order couple of things that were lost in translation but it wasn’t a big deal. Once it was mentioned it was rectified straight away. I actually don’t have many negatives but here are two though they can easily the rectified. I think one difference the Haram properties come and I realised this while there, is the pattern of guests. As this is a religious site and especially if in the summer most worship is during the night. We use to go to pray at 10pm and go back to our room at 10am to sleep. Wake up at 3 pm pray and do the same ritual. So when the staff wanted to clean the room we were sleeping. Couple of times the staff came into the room without knocking. Not acceptable. But maybe it was my fault for not having the don’t disturb sign on. I think this issue and potentially having a night time cleaning service/turn down will be a good option for Makkah hotels, especially in Ramadan. The hotel is finished to a very high standard. 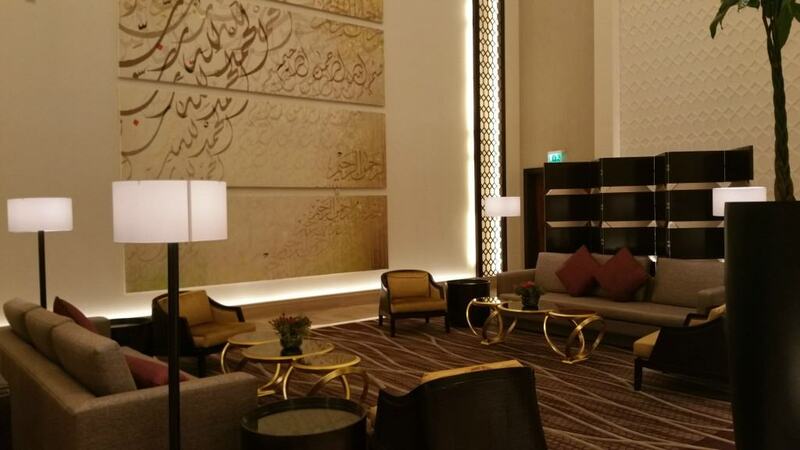 I loved the Arabic influence and art around the hotel, and it gave me some decorative ideas of making something modern and beautiful. The property at the moment is 15,000 points which is a great deal considering how much the cash price is. Even though there was some lost in translation overall the staff were excellent. They were always helpful and enthusiastic which is great, because sometimes staff are neither of those. They smile and make you welcome straight away. From the porter to the General Manager. I do have to disclose that I did become friends with some of the managers in the property. I do try to see it from a customers point of view though who will not have the the same relationship with the staff and I did observe a good level of service to other guests as well. You cannot beat the location of this property. It is only 2-3 minutes walk straight into King Fahad Gate which is awesome. In a few year when the Intercontinental will be demolished and the development completed, the property will be in the courtyard of Haram. At the moment the best location hotel is Intercontinental and I do have a review coming for this property soon. 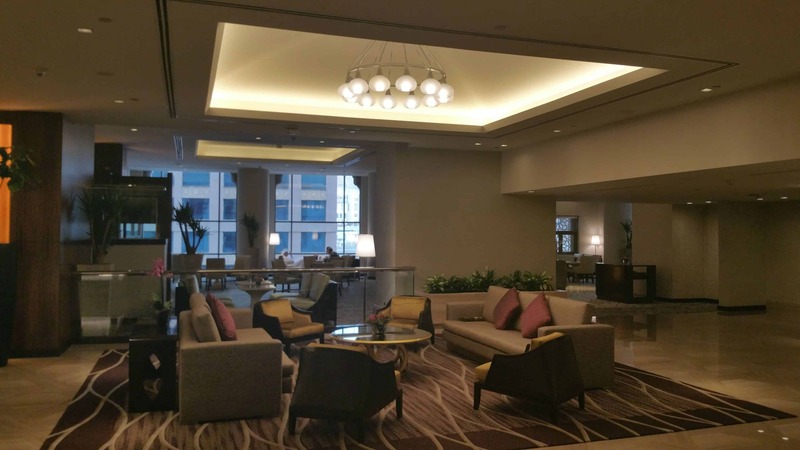 If you are a Hyatt Diamond member- gosh I pray to keep my status- you get 4 suite upgrades, lounge access and free breakfast. The property is not cheap on cash but definitely a very good value on points for 15,000 points or 7,500 + $100. I spent 8 nights there and I paid a fraction of what it would have cost me in cash. Actually £4,500 vs 60,000 points & £550. 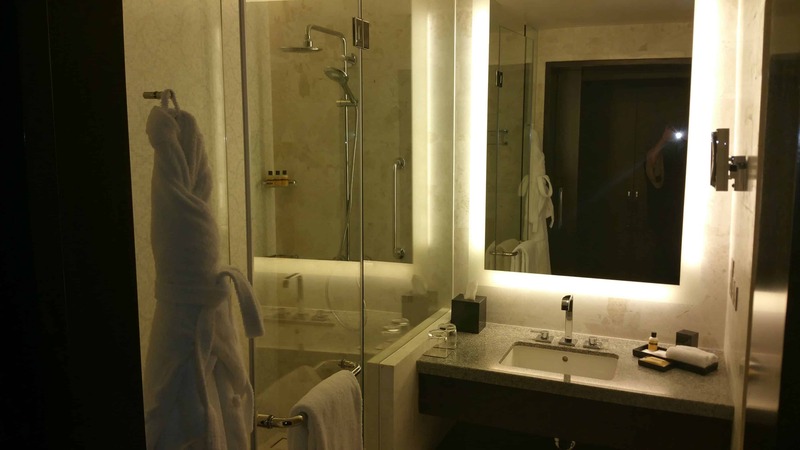 This must have been by far one of my best hotel redemptions ever. The reason why I love this hobby. To top it up actually I received 1/3 of my points back with the new Hyatt summer promotion. Overall I loved the hotel and I will be returning. I am sure that once the staff and the property hit 6 months of operation any small problems will be ironed out. 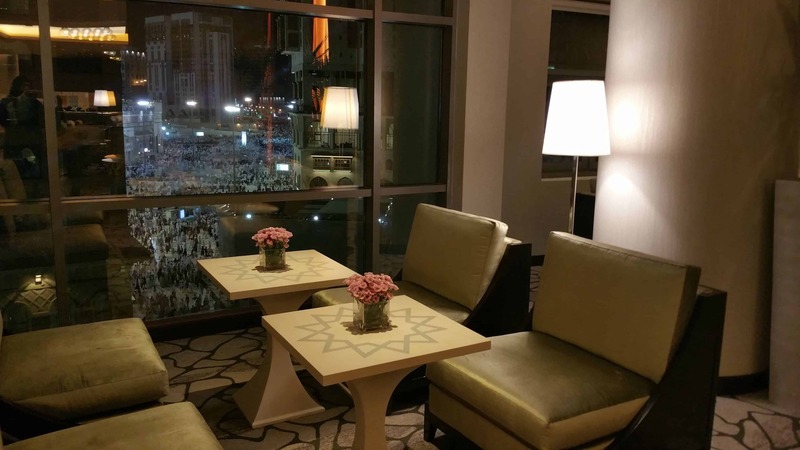 If you are staying in the Hyatt Regency Makkah for Umrah or Hajj and you need help, ask for Mohammed, Executive Assistant Manager Rooms and Noor, Food & Beverage Director, I am sure they will be happy to assist. They are truly exceptional assets and ambassadors to the Hyatt brand. Thx for this review. Normally I think: I can stay in every hotel in the world. Not really, there are exemptions. I’ll never be able to stay in Mekka, so this review is very interesting. Thank you for the great & detailed review. If you can suggest, I’m travelling with my father (in wheel chair n needs a close proximity hotel) this Ramadan and was planning to go with Hyatt over the Clock Tower options. Issue is that I have not seen this property or its entrance and everyone is suggesting me against it. Since you have had a thorough review I’d appreciate your suggestion on the matter. Salams, It will be easy for your dad to get in and out. The entrance of the hotel is on the mall level and only 2minutes to the Haram. You wouldn’t have a problem. Me my two sons stayed in regency hyatt in March/ April 2016. 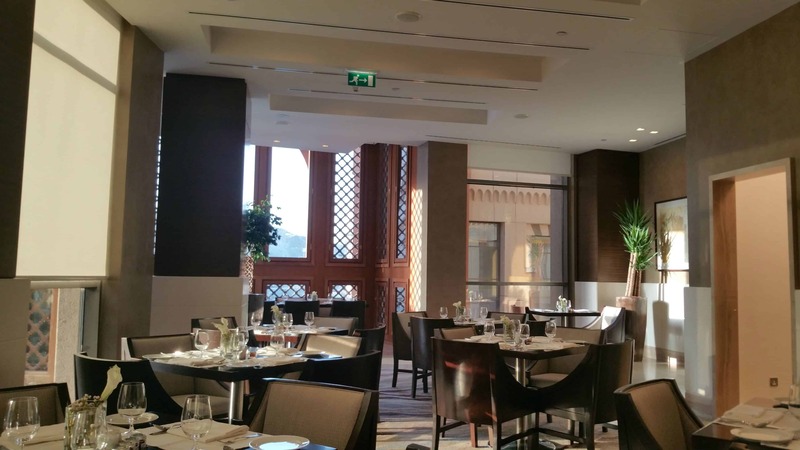 It was the most beautiful hotel in the close proximity of the haram. Staff were very attenuation and the breakfast was amazing. Can wait to go again In shaa Allaah. Salams it will be quite hard as there is a steep hill. You might want to consider going to a place closer. AA, I would really appreciate some advice. I would really like to go for Umrah with my 2 daughters in Spring of 2019 Insha Allah. I just don’t know where to begin etc. We live in Canada and would like to be comfortable in where we stay along as safe. Can you advise 0e 6n how I may proceed.. Thank you. I am so impressed by your suggestions. I am going with my mother for Umrah in November she can’t walk much and would be on wheelchair. Looking for a hotel close to Al Haram just incase she feels unease it will be easier to get her to the hotel. Please advice. Salams I would recommend, the Hyatt, the Conrad or the Hilton Suites, on the other sites you have the Clocktower hotels but it can get busy during prayer times though it might be easier as there is no crossing the road. Assalamu alaikum. Jazakallah for an informative website. I intend going for Umrah soon inshaAllah. 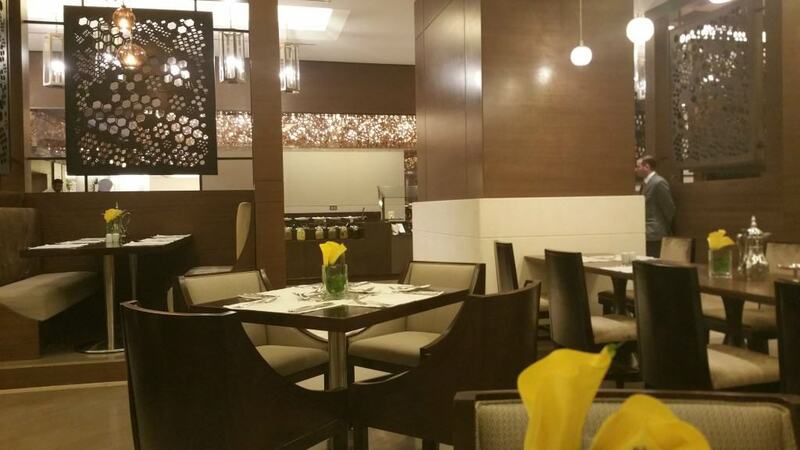 I have been told that Swissotel Al Maqam Makkah is a better option than Hyatt Regency and it is closer. Any suggestions? I was also told that officials close the road leading to the haram in front of Hyatt during busy periods so one has to detour to get to Haram. Any tips, opinions and suggestions (for Madinah as well!) will be greatly appreciated. You are walking from the hotel so it’s 5 minutes. Distance wise it is closer but the entrance to the mall and the Swiss hotel can get very busy during prayer as well as the lifts. Personally, unless you want high view I prefer the hotels on the other side as it’s quicker to get in and out of the hotel and into the mosque. Salam. We are going to stay in Hyaat Regency during our Hajj. Someone told us that it won’t be possible or easy to access Haram on foot and we will need bus or taxi ride to do so. Is it right? As far as I know this is not true. You cannot drive around from Hyatt it is across the road. What they mean is that they have roadblocks when its close to prayer so you have to walk up the street. You are better going earlier to avoid this.